Today, giant scale has developed into a whole new sector of the RC modeling community and truly gigantic planes are being developed to fill this growing special interest group. 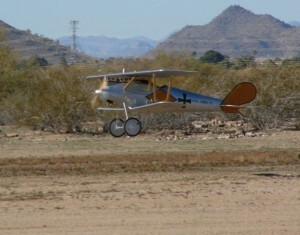 This 1/2-scale Pfalz D.III WW 1 German fighter impresses everyone who sees it take to the air. 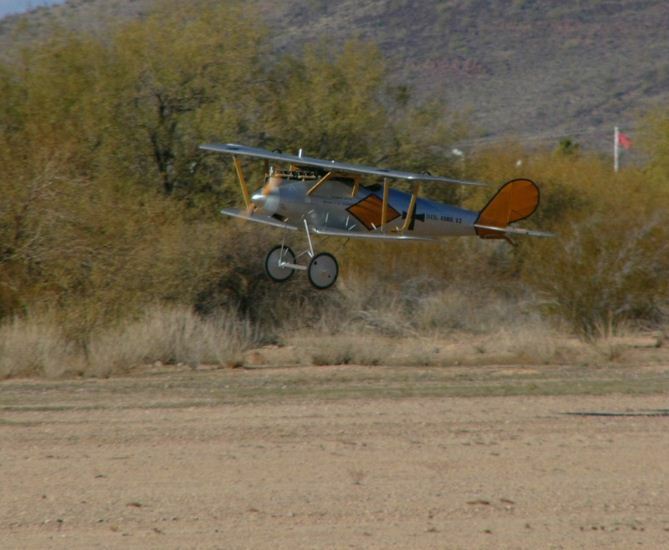 The plane is a custom built model built from an Arizona Model Aircrafters Short kit that includes many prefabricated parts. 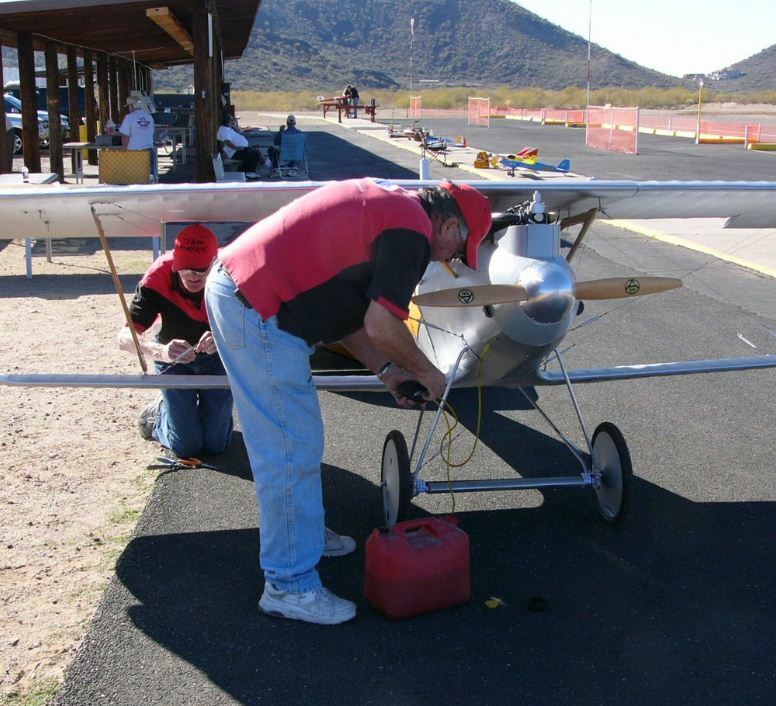 Jaime Johnson of Scottsdale, AZ is the owner/operator of the company and he developed the ½-scale project starting with a set of Tom Polapink drawings, and incorporated many traditional modeling materials with lightweight Experimental Ultralight Aircraft materials and construction techniques to produce a plane that’s both scale, and that conforms to the new Academy of Model Aeronautics super giant scale RC aircraft guidelines. The aircraft has a wingspan of just under 15 1/2 feet and it is powered by a 210cc twin inline ZDZ gas engine which turns an impressive 36×12 prop. 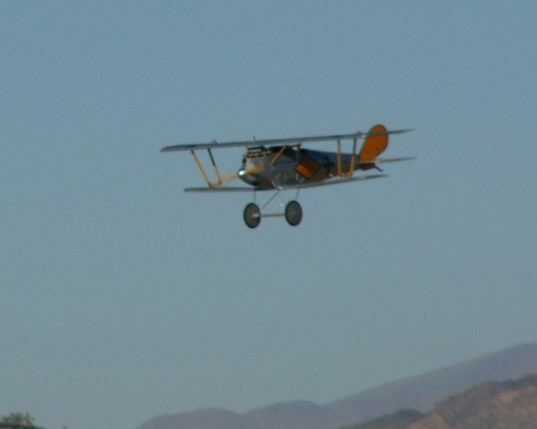 Bill Powers was the lucky test pilot and the aircraft was built by John Deacon, Bob Frey and Bill Powers. 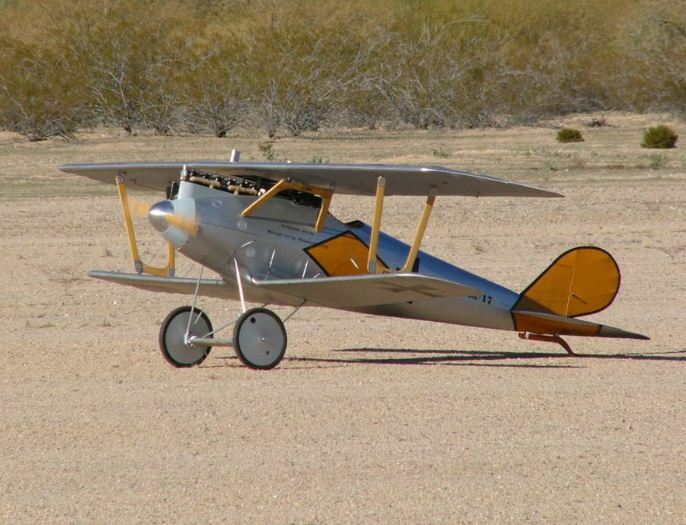 All the formers are made of plywood and the fuselage is sheeted in balsa (the full-size aircraft’s sheeting was plywood,) and the wing ribs are made from balsa and in some areas stiff cardboard capped with capstrips. The main spars are made of plywood and use I-beam construction. 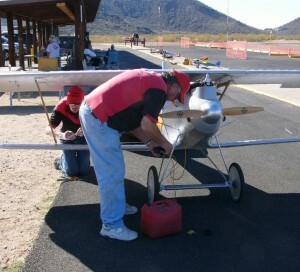 Bill used a JR 9503 2.4GHz transmitter and Hitec heavy-duty giant scale digital/programmable servos. Two for the elevator, and one each for rudder and ailerons. The ailerons being so far apart, use fiber optic servo leads and each aileron servo has its own LiPo battery pack for power. All rigging wires are functional (250lb. test braided fishing leader,) and the shock absorbing landing gear uses bungee cord suspension and the wheel are 18-inches in diameter and are from a bicycle shop. They are fabric covered to look scale. Right now the ½-scale Pfalz is hanging in a hangar at the Arizona Wing of the Commemorative Air Force Museum in Mesa, Arizona. 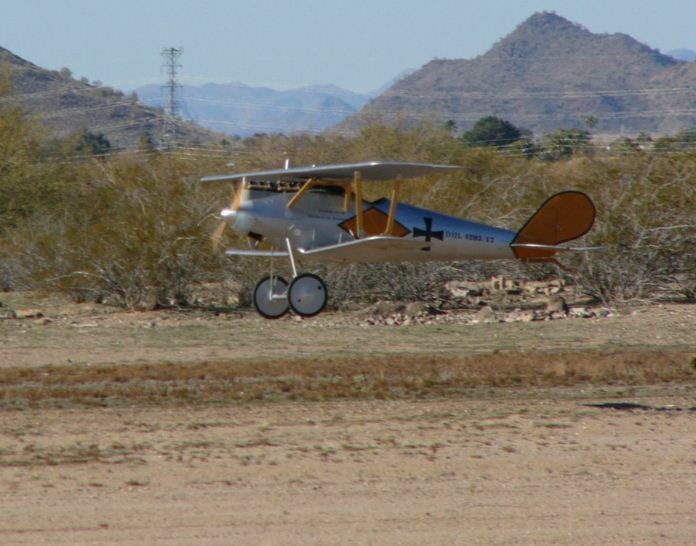 The full-size historical aircraft organization is hosting a WW 1 aircraft event and they wanted the impressive monster to be present at this full-scale aircraft event. C’mon where’s the video. Pictures are worth a thousand words but nothing beats video and sound too! Believe me – if we get video we’ll put it up super fast!! WW I era planes are one of my favorite RC planes and that Pfalz is a really great piece of work.. I would have liked to see them add a pilot as that would be frosting on the cake. I agree with the other responses, a video would be great. 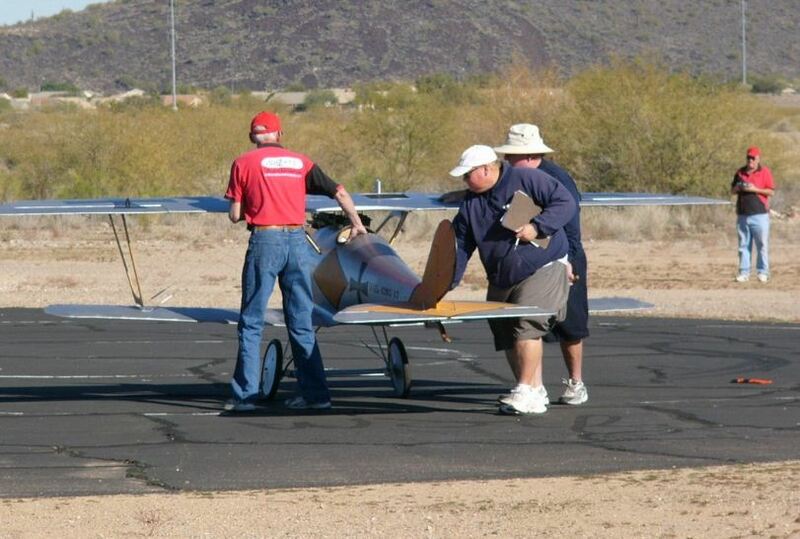 Whereas this large aircraft is very impressive, I believe this may be a dangerous trend for RC aircraft as a whole. 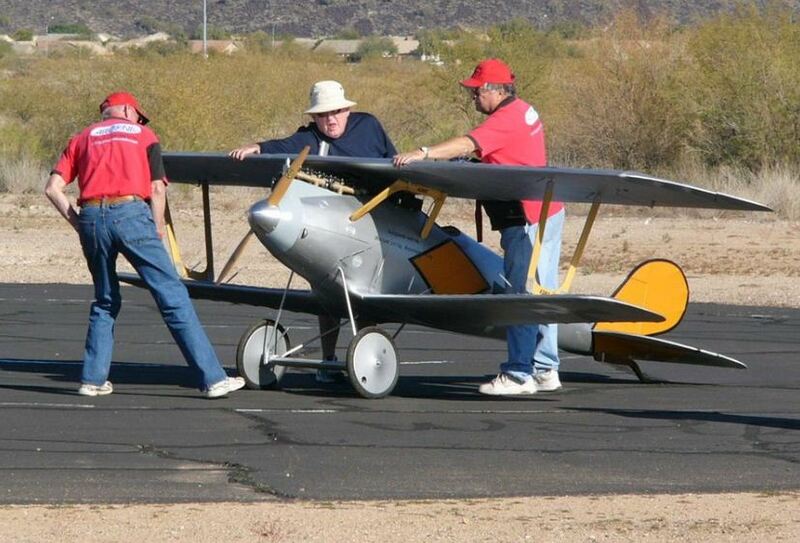 One can imagine the FAA looking at these large models as another way to regulate our hobby. And I don’t think we need that!! The AMA was able to negotiate certain rules in our favor last year, but that may not be the case if we see models of this size appearing in the future. Just a thought for discussion………and I would like to see the video as well!! I agree with Richard,although i really like the plane. But with the FAA breathing down our necks maybe we should wait and find out what the ruelings are going to be before putting that kind of time and money in a amazeing airplane. Exactly, the videogragher needs to take some courses on following the aircraft without jerking all over, proper zoom/focus and keeping the plane in the picture frame. The model is just amazing! However, the video camera person seemed to be struggling for some reason! I had to fast forward to the landing as I was getting dizzy from all the unsteady motion and unfocused setups! Get a real video person next time…!! A truly remarkable project. I was surprised that, for such a project, they didn’t arrange for a quality video. Really appreciate you guys sharing this model with the RC community. I wish I had the skills, patience, and time it takes to complete such a project. Congratulation on the completion and maiden flight of your model. Amazing Model!! almost not a model lol ! It is a shame when you can’t get the video you want, however people criticizing is not needed that is for sure. I have plenty of planes I have taken video of that I wish I had a better camera, better lighting, better camera person etc. however I am still glad I have at least some video of the plane and the experience. Video person needs some training,terrible.. Sounds like this plane needs more engine and/or more prop. Another giant RC plane flying in circles. Rather boring. 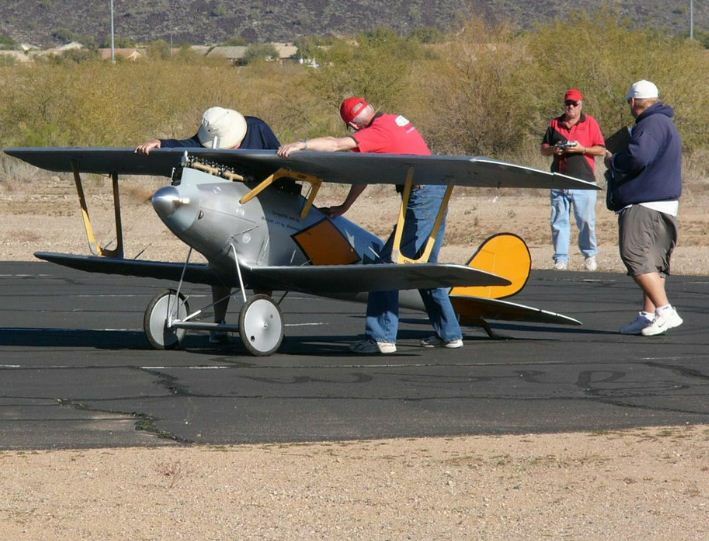 Again, why not just build a full scale plane that the pilot could fly from the cockpit, and go to radio control for the demo. Lots of time and money on this one.